What is a powder coated fence? A powder coated fence is a fence that has a special protective coating on the outside to keep it from getting rusty or damaged by the elements. Wrought iron in its natural state, without any protective coat, is of course liable to rust from getting wet, or even just from humidity in the air. It is therefore important to keep your fence protected from the elements so that it will last for a very long time and not get damaged or weak. There are plenty of rust-repelling protective coats and paints out there, but at Linmoore Fencing we provide powder coated fences because this coating has several advantages that our customers really appreciate. First, powder coating on your fence is chemically stable and does not off-gas the way many paints do. This means that you do not have to worry about air quality or contributing to global warming; your fence is completely eco-friendly and safe for your family and pets. Second, a powder coated fence is extremely easy to clean. 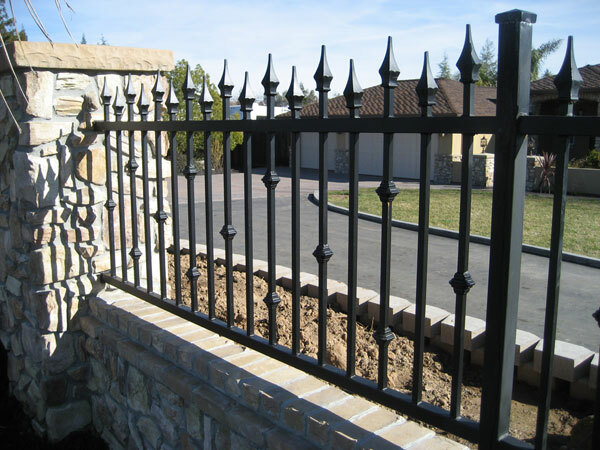 You might not ordinarily think about cleaning your fence, but dirt and grit have a tendency to grind on a protective coating, wearing it off and exposing the raw iron to moisture, which leads to rust. You can prevent this with easy maintenance on your powder coated fence – simply rinsing it with water from your hose will be enough to take off any dried-on mud or any dust that has blown on it during the dry months. In fact, the water from your sprinkler system is often enough to thoroughly clean your powder coated fence so that you will not have to worry about maintenance and rust prevention for a very long time. Third, your powder coated fence has a beautiful look, and the quality of the powder coat enhances the aesthetic beauty of the wrought iron. Your neighbors will be jealous and your guests and family will admire your wrought iron powder coated fence from Linmoore Fencing.